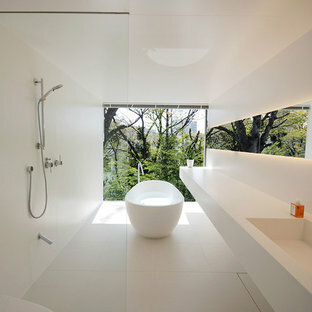 The Master Bathroom is quite a retreat for the owners and part of an elegant Master Suite. 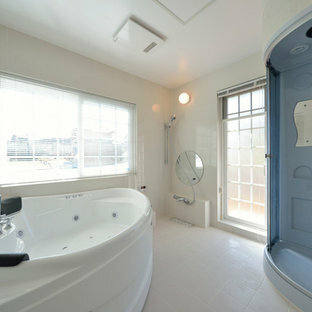 The spacious marble shower and beautiful soaking tub offer an escape for relaxation. 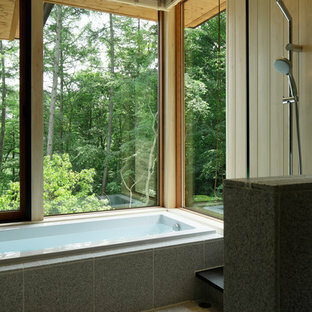 Inspired by the Japanese "roten-buro" (outdoor bath), this master bath uses natural materials and textures to create the feeling of bathing out in nature. Designer: Fumiko Faiman. Photographer: Jeri Koegel. 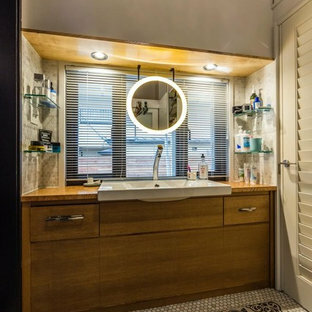 Traditional style bathroom with cherry shaker vanity with double undermount sinks, marble counters, three wall aclove tub, porcelain tile, glass walk in shower, and tile floors. 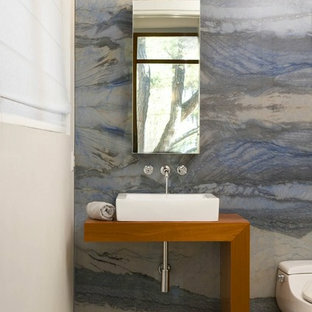 This showpiece in the master bathroom can be seen down the hall leading from the kitchen. Overlooking the backyard and view of the hills, the custom drapery allows for privacy and light control. Photo by Whit Preston.